Win Tickets to see ‘Archer’ Live At The Verizon Theatre!!! Good news, ‘Archer‘ fans. I have six tickets to give away for ‘Archer’ Live at the Verizon Theatre in Grand Prairie on Saturday, June 22nd. This is going to be an amazing show full of thrills, chills, and lots of laughs. H. Jon Benjamin, Aisha Tyler, Chris Parnell, Amber Nash, Lucky Yates, and Matt Thompson will all be there in person. What a night to remember. To win tickets, send me an email at boomstickcomics@gmail.com with subject line “Archer Live’ or post a comment below on your most favorite episode of ‘Archer’ and why. Most creative answers will win and I will notify the winners via email in 24 hours. Winners will receive two tickets to the event. Best to all of you. Archer Live!, featuring the all-star cast and producers of FX’s hit original animated comedy series, is coming to Verizon Theatre at Grand Prairie on Saturday, June 22nd. Tickets on sale now at AXS.com, charge by phone, 888-929-7849, or at the Verizon Theatre Box Office. Archer Live! is a must-see for every fan of Archer which premiered its fourth season in January on FX. Archer Live! features a moderated discussion, a live reading of classic scenes from the Emmy® Award-nominated series, and an audience Q&A with the all-star cast where fans will have a chance to get the inside scoop on their favorite show. Talent appearances include H. Jon Benjamin as Agent Sterling Archer, Aisha Tyler as Agent Lana Kane, Jessica Walter as Malory Archer, Chris Parnell as Cyril Figgis, Amber Nash as Pam Poovey, Lucky Yates as Krieger, series creator/executive producer Adam Reed as Agent Ray Gillette and executive producer Matt Thompson. Schedule and talent participation is subject to change. Thanks everyone for your emails. There were some really funny ones. All Winners have been notified! If you didn’t win this time, stay tuned, for we have some upcoming cool contests with prizes ranging from free movie tickets to free blurays and dvds. Thanks for playing. This entry was posted on Friday, June 21st, 2013 at 8:30 am	and is filed under Events, News, Television. You can follow any responses to this entry through the RSS 2.0 feed. You can skip to the end and leave a response. Pinging is currently not allowed. I emailed this to you too, but I want to make sure everything goes right so I am posting my entry here too. 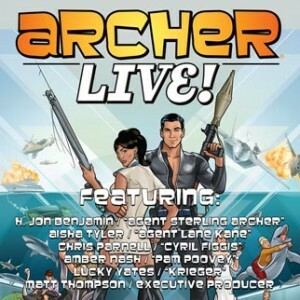 I really want to be able to go to Archer Live haha! I am a HUGE fan of Archer! The contest page said to pick your favorite episode, but I can’t pick just one! I’ll narrow it down to a few though. I’ll start with Heart of Archness: Part I, Part II and Part III. These were probably my 3 favorite episodes in the history of the show. From start to finish, they were hilarious! I loved David Cross’ guest role as Noah! Archer’s interactions as Pirate King were absolutely hysterical! I laughed harder at these episodes then any other episode. Another episode that I thought was hilarious was the Diversity Hire episode in season 1. Archer’s interactions with Conway Stern was great! The locker room scene was the best! When Archer is explaining what happened I laughed hysterically! “Does it matter where?! ?” was one of my favorite lines during that part hahaha. And finally, any episode in which Archer sings Danger Zone is classic. Gotta love H. Jon Benjamin singing Kenny Loggins! Thank you so much for this opportunity! I would absolutely LOVE the chance to see Archer Live!!!!!!! Have the winners already been contacted? I’m anxious to hear if I won! « Helena Bonham Carter Will Play the Fairy Godmother in Kenneth Branagh’s ‘Cinderella’! !